Modi said depositors' money in the banks is completely safe and their interests won't be allowed to be affected in any way. NEW DELHI: Scotching rumours that depositors' interest will be harmed by a new legislation, Prime Minister Narendra Modi said their money in the banks is completely safe and their interests won't be allowed to be affected in any way. "...the government is constantly taking steps to strengthen the banking system. The interest of the banks will be secure, the interest of the customers will be secure, then the interest of the country will also be safe," Modi said. "In such a big role of institutions like FICCI, it is also with the right information to make the industry and people aware. Now, for the past few days rumours are being spread about the FRDI bill. The government is working to secure the interest of the customers, in order to safeguard the interests of the customers, but the news is being played in the opposite direction," he added. 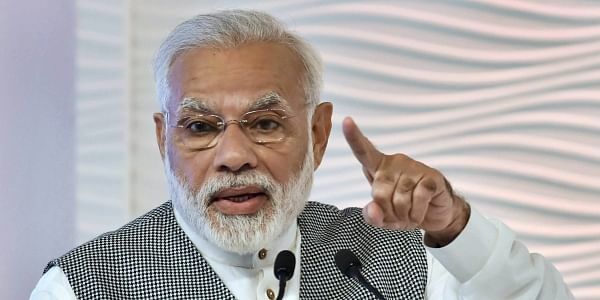 Modi was apparently referring to the raging controversy over a bail-in provision in the FRDI Bill under which banks will be allowed to forfeit major portion of deposits of account holders in case of crisis in the financial institution. The Prime Minister said the UPA government had completely spoilt the banking system. The biggest liability passed on by the previous government was the non-performing assets (NPA), he said. "Nowadays, the non-performing assets, the NPA-NPA attack, is the biggest liability given to this government, of economists sitting in the previous government." Modi said the last government had put pressure on banks and forced them to lend to influential people, which further led to NPAs. "The people in the previous government knew, the bank knew, the industry was also aware, the market-related institutions also knew that this was going wrong. It was the biggest scam of the UPA Government. Commonwealth, 2G, coal, bigger scandal than all these. It was a kind of robbery of the public's earning by people sitting in the government through industrialists." He said his government was working to create a system that was transparent and sensitive. Talking about the Goods and Services Tax (GST), Modi said the government's effort was to ensure that maximum businesses register for GST. "The more formal the system becomes, the more it will benefit the poor. It will enable easier availability of credit from the banks, and reduce cost of logistics, thereby enhancing competitiveness of businesses."